127.5 x 101 cm / 50.197 x 39.76 in. R. Lattuada, in Artemisia Gentileschi e il suo tempo, pp. 262-263. Rome, Palazzo Braschi, Artemisia Gentileschi e il suo Tempo, 30 November 2016-07 May 2017, n. 86. R. Lattuada, in Artemisia Gentileschi e il suo tempo, catalogue of the exhibition ed. by F. Baldassari-J. Mann - N. Spinosa, Milano 2017, pp. 262-263. 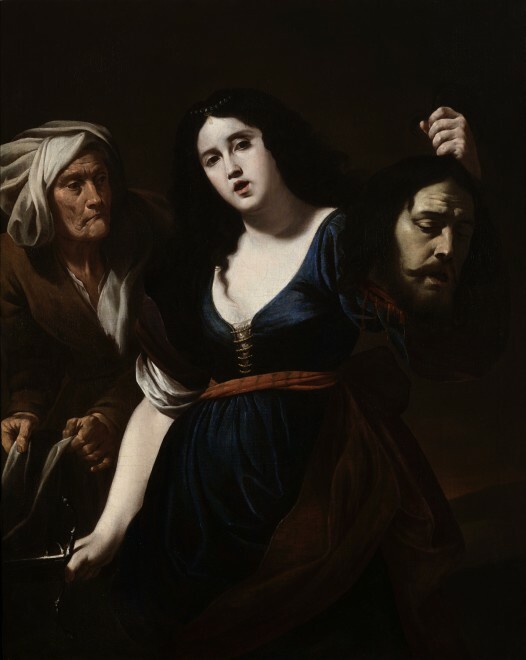 The present painting had been for a long time in the Getty Museum collection, Malibu, and is a version of the Judith signed by Andrea Vaccaro in the castle of Hadrec in Moravia. Our Judith was shown at the Ringling Museum of Art in Sarasota in 1961 with the correct attribution to Vaccaro by Roberto Longhi. Fredericksen (1972) also mentioned a previous reference to Ribera. The biblical heroine – the rich and gracious widow, who saved her home city of Betulia from the attack of Holofernes, killing him after a banquet – is holding the head of the general and fixing her gaze on the viewer; an old servant appears behind her back. The painting has firm analogies with the Salomè that Caravaggio painted during his second stay in Naples (1609-1610), now at National Gallery in London (fig 1): the composition appears to be very similar, with particular regards to the head of Holofernes and the sad face of the old lady. The present painting can be dated to 1620s, at the beginning of Vaccaro’s activity, when he approached the Caravaggesque naturalism, painting copies of important works by Merisi: the Flagellazione in San Domenico Maggiore, David (Naples, private collection), David and Goliath (Florence, Fondazione Roberto Longhi), David (unknown location), Martyrdom of St. Sebastian (Naples, Perrone Capano collection) and others. The present painting has many similarities with the painting of the same subject by another Caravagesque painter, Valentin de Boulogne, in Toulouse, particularly their facial expressions: Judith’s face is full of tiny light modulations, almost gentle and calm, as if the biblical heroine was unrelated to the dramatic event that just happened and of which she was the protagonist. Very little is known for certain about Andrea Vaccaro; at the age of sixteen, he was the apprentice of Giovanni Tommaso Passaro, a minor artist, of whom scarcely anything is known. Therefore Vaccaro’s early life is particularly obscure, although he was one of the most prominent painters of Naples in the seventeenth century: almost every collection in Naples boasts at least one painting by him. Vaccaro was praised by Bernardo De Dominici, the eighteenth-century biographer of Neapolitan artists, as “nobilissimo professore” (a very noble professor); and even hailed by Onofrio Giannone as “Raffaello Napoletano” (Neapolitan Raphael). His fame among his contemporaries spread also to the rest of Europe, especially Spain. According to De Dominici, while imitating Caravaggio, the young Andrea Vaccaro became a very close friend of Massimo Stanzione (1585?-1656), who alerted him to the errors of his Caravaggesque ways and advised him to take inspiration from most beautiful and noble manners of the Bolognese artist Guido Reni. The biographer recounts how Stanzione and Vaccaro inspected Reni’s paintings together, especially his half-length portraits, in the private collections in Naples. The two artists were both accused of Eclecticism, since they shared the seventeenth-century Neapolitan approach of combining elements of the naturalism of Caravaggio (and Caracciolo and Ribera) with those of the classicism of Bolognese painting. The artwork described above is subject to changes in availability and price without prior notice.